Gelora Bung Karno (GBK) Transjakarta bus shelter revitalization which is done by PT. Transportasi Jakarta (Transjakarta) is appreciated by its customers.
" As the result, this revitalization get many appreciations from customers"
PT. Transjakarta President Director, Budi Kaliwono mentioned, that bus shelter revitalization is done to provide an optimal service for Transjakarta customers. This shelter is one of central shelters and becomes center of the movement since it is located near Asian Games venue. Revitalization is done on the entrance and exit gates from only one door into eight doors. "As the result, this revitalization get many appreciations from customers because it becomes more comfortable and safe," he said, Wednesday (8/29). 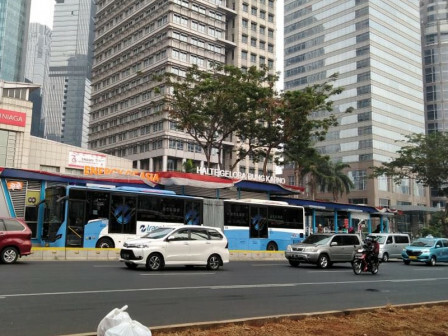 Since the door is added, he continued, Transjakarta bus shelter is enlarged from 20 meters into 51 meters and now the shelter can accommodate up to 612 people. Meanwhile, one of its customers, David Firman (30) admitted this revitalization makes him become more comfortable and safe. Because additional entrance and exit gates make it easier for customers to ride a bus and get off from the bus. "Usually, it takes a long time to wait for queuing. But now it becomes faster and wider," he conveyed.